Ever since the legendary AS Pop Music team (Megan Housekeeper and Jordan Swider just to name a couple) put on the first Lawnstock three years ago, I always get excited when it’s that time of the year again. Saturday, June 4 was a warm and sun filled day, perfect conditions for Lawnstock. The Communications Lawn was lined with local food carts, a swinging ship ride, info tables, and of course the stage. I initially thought the hype was a little bit lower than I had experienced but by the end of the night it all felt familiar and great. On first was Battle of the Bands winner, Crooked Neighbors, who took the stage and played a pretty tight set of alternative upbeat music. Two things really held my attention while watching them perform – the use of acoustic guitar and cello, and the amount of noticeable fun they were having. Their songs seem familiar enough that you may have heard something similar before, but the use of acoustic guitar and cello help add freshness to the music. It’s always great to see a band genuinely enjoy their time on stage. Up next was Snug Harbor. They had people dancing and standing at the front of the stage almost right off the bat. Their set was full of funky and foot moving tunes. Their ability to grab the attention of the crowd was impressive and their performance was solid. It was also nice to see them in an all ages setting as well. I know they can get a party going at the Wild Buffalo, and certainly bring one to an all ages show as well. COSMOS took the stage next and were easily my favorite group of the night. This full hip-hop ensemble was incredibly enjoyable, and further proof of how awesome hip-hop can be. They left a lasting impression of how to do it right as a band – how to make music, how to come together and be something worth remembering. Thought provoking lyrics, grooving melodic and percussive arrangements and fantastic stage presence are just a few things from a long list of things that they do well. After such a great set, I was eager to see what was up next but was sadly disappointed. The Flavr Blue just didn’t grab my interest. While the crowd was somewhat engaged, I found their set of electronic soul music to be forgettable. I really did appreciate the use of instruments beyond their laptops and it did seem like they were having a great time but after seeing the show up until that point I was underwhelmed. I would love to give them a second chance though. Lastly was Mary Lambert. The whole crowd was buzzing about her being her and rightfully so. She’s very talented. Technical difficulties caused her to go on 40 minutes late and I was not jazzed about that. While the whole night was progressively running more and more behind this was the tipping point and I just wanted her to go on. Thankfully, she did, and her excitement to be there was palpable. She played a set full of heartfelt music with positive messages about a myriad of subjects like queerness and body positivity. She even gave a sneak peek of one of her new singles to which the crowd cheered enthusiastically. While I thought her performance was solid and maybe filled with just a bit too much talking, the biggest impression I saw was on social media the next day. To see how she has impacted so many people I know in a positive way was incredibly admirable, and I’m glad she does what she does because as I’ve mentioned she did a wonderful job. This was a fun night. Jameson was on the specials board and the lineup was a great collective of Pacific Northwest indie music. First up was Bellingham’s The Co-Founder, a duo playing a set of sad, indie rock jams. The crowd slowly began to trickle in and the band’s music was pretty solid. If you’re familiar with their recordings you know the music has a very Bon Iver-esque sound, but with the change from acoustic to electric guitar and some drums the songs are completely different. The duo did leave me wanting more. It left me wanting more members. The songs have great potential to sound huge, and the band performed like they should be huge. I was daydreaming throughout their set about how an additional guitarist, bassist and some press (see what I did there?) would be something Bellingham couldn’t help but notice and gravitate toward. I did appreciate how lead singer and birthday boy, Hayden Eller, called people to actually form a crowd. They listened and a crowd suddenly appeared at the front of the stage. That takes guts and I respect that. Wampire was on next and were very loud, to say the least. Probably louder than they had to be but I guess that’s what they liked. From the crowd, I could see that people were enjoying their energetic indie rock but those without earplugs were visibly suffering. To be fair, don’t forget your earplugs, but also to bands out there, the sound guy mics your amps for a reason so there isn’t really a need to turn it up to 11. Beyond that though, they did have a great set and it was fantastic to see them perform. They were tight and together. While they take from a lot of familiar indie rock sounds, they also incorporate some elements of more classic 60s era rock, which work splendidly together. Vacationeer took the stage next and easily had the biggest draw of the evening. It was wonderful to see Jase and Nikko perform after being on tour with Iska Dhaaf for several weeks and draw a crowd of friends and fans. Throughout the years of Vacationeer they’ve honed in a dreamy indie sound that isn’t really heard in indie music let alone by an indie duo. The mix of electronic and acoustic drums with ambient atmospheric guitar beautifully melded together by these two. Iska Dhaaf finished the night off with an enthralling and exciting set. As Jase and Nikko of Vacationeer are a part of the touring group of Iska Dhaaf, they certainly help this band take their music to the next level. They were solid and fun to watch. The set was a great balance of songs from their new album and now classics such as “Everybody Knows” during which, lead singer Nathan Quiroga took the mic and jumped into the crowd. This band is a prime example of what it means to keep a crowd engaged, entertained, and listening. The Shakedown was vibrant before the music even started. A steady flow of listeners floated into the bar, searching for familiar faces. The stage, ominously lit, directed one’s gaze to an open suitcase reading LONEBIRD over the image of a Phoenix. The crowd speculated as to what was to come. A leather-clad man wielding a guitar sported a tambourine mounted to his head. He took the seat behind the suitcase. An intimidating howl from his amp shifted into a haunting blues riff paired with a menacing glare, which silenced the floor. The set that followed consisted of grimy garage-blues getting everyone’s attention, and hips swaying. Next up was The Phone Books, which includes LP, Gabe Taylor, Jason Sands, and Lincoln Brintnall, had a diverse sound which ranged from high energy rock and roll to dark riff-heavy gut punches. A no-nonsense approach to stage presence added to their crescendo of a setlist. They began to ramp up the audience into a rowdy lull; it was a preparation for the attack to follow. Keep your eyes open and have earplugs handy for whatever this group does in the near future. As The Phone Books left the stage, fans went for one last drink or smoke in preparation for the sonic gauntlet that is Daikaiju. A primal cacophony of drums took everyone by surprise. Two drummers shared the stage, trading an ambitious array of polyrhythm. The rest of the group rose from the crowd, eliciting an eruption of applause as another new member joined them onstage. Not only did Daikaiju sport two drummers, but two bassists as well. As the energy reached its peak, the drums and feedback ceased like a long breath. Front row bangers arched back in preparation as a pit began to form. The band took formation and hit a monstrous downbeat. As Daikaiju descended into the end of their set, the drums were moved to the floor with the audience surrounding them in a ritualistic fashion. One supercharged overture later, one of the drummers being lifted by fans finished the song high above their loyal subjects. At the climax the drums were piled together and set ablaze, the guitars were all given to the audience and Daikaiju fled to their next attack. The Shakedown was left wet with feedback and applause. The extra members turned Daikaiju into a literal wall of sound. Concussive blows left fans wide eyed and shaken. Insane guitar work paired with well-rehearsed, road-tested stage antics make for a mind-blowing experience. When a show is referred to as a Daikaiju attack, know they mean it. Laura Gibson approaches the stage unassumingly and silently slings her guitar strap over her shoulder. “Hello, I’m Laura Gibson,” she says gently and grins into the darkened room. Gibson’s voice floats up and down effortlessly, cooing deeply as the intonations steepen in harmonic valleys before rising to a peak once more. Her lyrics tell stories of loneliness, travel, and the constant search for meaning in life’s complexities or mysteries. This is particularly displayed in the song “Empire Builder” in which she reflects on a train trip leading her from her home in the west to the East Coast. In the song she explores the proportion of the leap from east to west while also hinting at some of the reasons why she’s on the train in the first place. “This is not an escape/but I don’t know how to hold someone without losing my grip.” In her song “The Search for Dark Lake” Gibson tells her story about romanticizing a mysterious lake during a stay in the woods when she learns the true meaning behind the name. Spectators gazed intently and silently at the stage throughout the set, unable to remove their eyes from an artist whose artistic visual and technical skills are on par with some of the best folk singers around, captivating the listeners until the last string was strummed. On a homemade synth stand and stool, Bazan sat nervously toying with his DIY setup while maintaining small talk and answering questions from the audience in typical fashion. “Did you dye your hoodie?” or “How’s Tim doing?” Bazan smiles and answers each question without hesitation, making the show feel more like a living room session where everyone is among friends. He presses a few buttons of pre-recorded vocals and chuckles to himself about how weird the process is in comparison to other tours. The newer songs, however, are just as iconic as the old, featuring his same aesthetic with a refined new vision representative of a new path taken in his own life. Some mouthed the words to classics like “Options” while others danced along to newer versions of “Both Hands” and “Someone Else’s Bet.” But perhaps the biggest commonality for most was that it was just good to see David again. Late to the venue and just setting up for their soundcheck, Rogue Wave filed onto the stage tinkering with gear and hitting snare drums while guests filed into the fully lit bar. As Rogue Wave’s sound person raced frantically back and forth, many ordered beers and chilled in anticipation for the headliners to take the stage for the real set. After some time, Seattle’s own Hibou took to the stage in full band form featuring drums, rhythm guitar and bass. Hibou played an energy-rich set with dreamy guitar rhythms, heart pounding bass drum kicks and dance-worthy melodies that kept the audience moving for the entirety of the set. Hibou’s newest album, half-recorded at home with percussive mishaps of Peter Michel’s father hammering in the background, is reminiscent of an 80s pop album in many ways with heavy reverb immersing each track. When it came time for Rogue Wave to take the stage, a fog machine clouded the entrance to the stage, veiling the shadowy figures of a familiar band as they took to their stations behind each instrument. Once they started “Look at Me,” blue and green tinted lights ignited behind them, adding a supernatural hue to the floating fog around the stage. The audience cheered and screamed as the song faded. Later in the show, pulling an oldie from their back pocket, guitarist and vocalist Zach Rogue began the intro to “Eyes” which is no doubt on most of the audience’s playlists from 2007. Toward the end of the night, drummer Pat Spurgeon nailed the floor toms and kick drum introducing a classic favorite “Lake Michigan” during which half the audience lifted their phones to record the spectacle as the lights shifted from green to red. On Friday, June 3 we were treated to the 11th installment of Acorn Production’s Urban Music Festival. 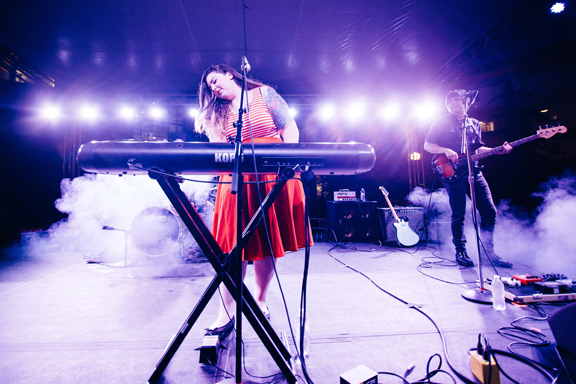 Having taken the previous year off while the band worked on other projects, this year’s lineup welcomed back the local music devotees with open arms and an open alley. Rocking two stages in the perfect weather the show began on the alley stage with local DJ Jimminy Glitch. The crowd was already excited as they pressed to the stage and Glitch’s sick beats elevated the event right out of the gate. With the inside stage getting ready to kick into gear, the decision needs to be made to finish the DJ set that started it all off, or move inside for a world music explosion. Dehli to Dublin hail from Canada but are no strangers to the States or the Wild Buffalo. This band absolutely launches with the first note. Their fusion of traditional Celtic, Indian, Asian and good-old-rock-n-roll is irresistible, grabbing you by the ears and pulling you onto the dance floor. Bodies moving all around, sweat flying, drinks spilling and smiles everywhere. It took the promise and talent of Willdabeast to pull us away. Back outside into the warm night air. Their set already began, the crowd held gently in their palm, Willdabeast blasts live brass and synth over beats into the streets of Bellingham and the angels sing. Will Glazier and Dan de Lisle have been making music together for years with Snug Harbor and Michal Menert’s Big Band, yet even with a hectic and seemingly constant touring schedule they have still found time to expand and explore into this genre with amazing results and ever growing skill. It’s Friday, we are still young(ish) and Acorn Project is about to come on. Back inside! Acorn Project has been constantly tweaking their tunes over the years in an effort to keep the sound fresh while keeping crowd favorites in the rotation, but one thing that has remained is that soulful sax. It lends a quality to their cosmic rock jams that I simply cannot put into words. The swagger that floats out of the Acorn collective when they are on point is everything great about live music; after countless shows I still leave everyone amazed and elated that I was a part of the magic. Yep, that all just happened, end night one. Back to the inside stage Baby Cakes is already killing it. They seem to be everywhere lately and for good reason. Their blend of classic soul and R&B teamed with Stephanie Walbon’s effortless vocals is irresistible fun. It’s all the music you loved your whole life. Every track a sing-a-long. Hanging on till the last note I eventually made my way outside again. Manatee Commune (Grant Eadie) is up and the feel is mellow. Warm ambient live guitar layered over synth beats and earthy tripped out visuals on screen. Progressing through his set, which also included live violins and a track called “White Smoke” which was credited as being the big one that really pushed him as a DJ, his sound absolutely melted into the warm night air. Back inside and the circus is in town. Hooping, juggling, aerial ribbons and fan dancing cows… oh my! Needing some air after that, hanging in the alley chatting it up and getting everyone’s take on the performances over the weekend. Suddenly the sounds of an electrofunk orchestra crawl out the back door. Acorn Project is tuning up. The instrumental intro builds in intensity moving through the room, affecting the crowd until it’s inevitable explosion. Flying through their set with a mix of originals and covers they once again showed the crowd what devotion to your dreams can sound like. They have fun up there, they truly enjoy playing together and you can see it on their faces and hear it in the air. The night closed out with Kreestoe standing up at his kit and murdering the drum skins smiling from ear to ear. Perfect.